Home News Reports Fact check: Did Congress govt release more funds than Modi govt for urban infrastructure in Karnataka as Rahul Gandhi claims? In an attempt to take a dig at Prime Minister Modi, Congress President Rahul Gandhi claimed that the NDA led Central Government has provided lesser funds for urban infra development as compared to the UPA led Congress government as far as the state of Karnataka is concerned. Calling Bengaluru, the garden city & the pride of India a “garbage city” is insulting. However, Twitter user and CS Ashutosh Muglikar nailed Gandhi’s lies by providing factually correct figures. 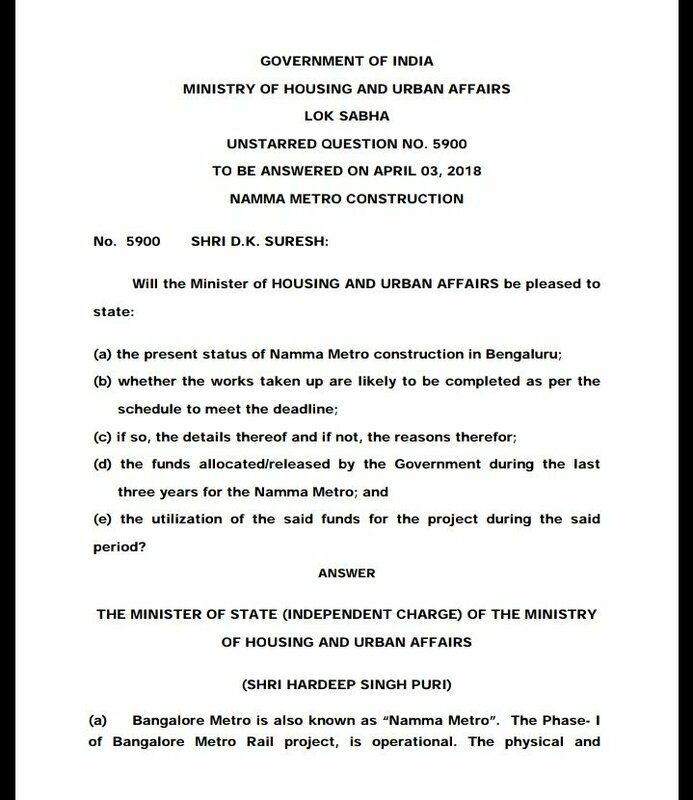 As per data [pdf] provided by Government of India in the Lok Sabha starred question on 3rd April 2018, under the Atal Mission for Rejuvenation and Urban Transformation (AMRUT), the Government of India has approved a State Annual Action Plan for Rs. 4,952.87 crore of which committed central assistance is Rs. 2,318.79 crore. In Swachha Bharat Mission (Urban), Rs. 166.88 crore was released to Karnataka state government in past 3 years. Under the Pradhan Mantri Aawas Yojana (urban), a total of Rs. 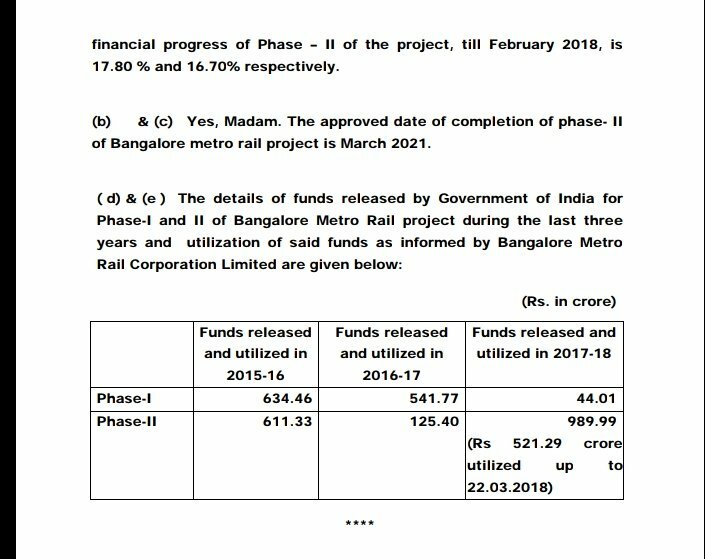 1,771.32 crore were released in past 3 years in Karnataka as of 28th March 2018. Under the Smart City Mission, Karnataka, with seven cities, got 836 crores from the Central Government, second highest only after Tamil Nadu which got Rs. 848 crore for 11 cities. With respect to Namma Metro construction in Bengaluru, Rs. 1,220.24 crore was released and utilized for phase one over 3 years and Rs. 1,726.72 crore was released for phase two over three years. This takes the amount released by Central Government to Karnataka state over last 3 years itself to Rs. 8,039.95 crore, way higher than what Congress President is claiming. In fact, Rahul Gandhi’s tweet claimed that Congress had released Rs 6570 crores as urban infrastructure funds for the state of Karnataka. As per record, the total funds released to Karnataka by the BJP led central government is 8,039.95 crores, higher than what the Congress government had provided. Rahul Gandhi and the Congress party have developed a penchant for blatant lies and misrepresentations. Recently, we had fact-checked his assertions regarding MSP for farmers as peddled from his Twitter account. He had also lied about BJP/RSS being responsible for the vandalism of Periyar statue in Tamil Nadu. And as if his lies weren’t enough, he was caught asking the singing of the National song, Vande Mataram, be cut short during a Karnataka rally. It would certainly seem like Rahul Gandhi is clutching at straws trying to retain Karnataka, the last bastion of the Congress party.